Modern Law of Meetings comprehensively deals with the law and practice of UK company, insolvency, local authority, and public meetings, as well as meetings to conduct business in general. 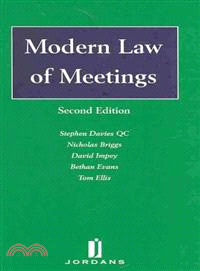 The book provides a thorough analysis of the meeting process, including the decision on when a meeting is needed, the convening of a meeting, its conduct and management, and the keeping of lawful and adequate records. It deals with related topics, such as defamatory statements, breach of the peace at public meetings, and the various means of challenging decisions taken at meetings. This second edition has been thoroughly updated to cover the law relating to shareholder meetings and resolutions which has been substantially changed by the UK's Companies Act 2006. The changes and procedural issues that all companies need to get to grips with include: a new procedure for written resolutions a?￠ new rights and procedures for proxies a?￠ relaxations for private companies, such as the abolition of annual general meetings and extraordinary resolutions a?￠ new rules for passing ordinary and special resolutions a?￠ increased shareholder rights which can increase the administrative burden in relation to meetings for quoted companies. The chapters on local authority meetings have been significantly revised to take account of the provisions of the UK's Local Government and Public Involvement in Health Act 2007, which made a range of changes to decision-making in local authorities. The book also covers the new code of conduct for local authority council members on when they need to declare interests and withdraw from meetings and when they can address the meeting.